today is the SECOND post for this event! If you want to see the original (first) post with the first interview with Esther Dalseno, click here. But today, today is a new author! I'll give you a hint in the paragraph as I just talk about a few upcoming secrets, that I have been working on in January. But I've already told you pretty much everything! so what else is there to tell you? other than the authors that I will be interviewing! So this small paragraph is really just a clue to the author that I'll be interviewing. Hey! Also, in March or April I'll be going to Arizona, maybe . . . Phoenix, Arizona. Please tell me you got the clue, I spent about an hour just to come up with that paragraph. if it doesn't make sense, eh, but just find the three words that are highlighted and BOOM hint . . . more like answer but who cares! Onto the interview with the Lovely, sweet, and wonderful . . .
and did you know, that the first TWO authors for the interviews both are working with OfTomes Publishing! that's exciting! Gabriella- I tend to stick with a variation of the same resolution every year: to be considerate, to be happy, and to enjoy every day -- even the bad days! Gabriella- I had a new release out December 2015 so January will be all about celebrating that and working on the sequel to Secrets In Phoenix. Gabriella- Music! I find that music is a great way to ignite inspiration. Also, surroundings help. I can't help but daydream when I'm around nature: forests, the sea, castles! the editing process is always the hardest part for me. Making sure all those sentences flow, and everything comes across in the way you wanted it to. It's a tricky task, but it's all worthwhile in the end. Gabriella- Oh, good question! There are so many quotes that I love; from history, or books and films, etc. I really like the quote from Martin Luther King Jr: "Faith is taking the first step even when you don't see the whole staircase". Question 6- Where do you see yourself in five years? 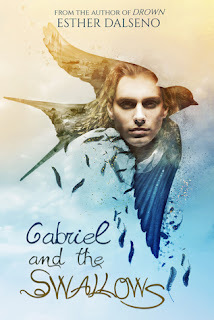 Gabriella- Writing and hopefully bringing out lots of books that people enjoy! Gabriella- I'm from Wales in the UK. It's quite a magical place, lots of myths and legends! Gabriella- It has to be L J Smith. I love her books and her writing style in general. She's an inspiration. Question 9- What are a few books you want to read this year (2016)? or what Genre do you like to read most? (Author can choose either question--freebie). Gabriella- I love YAs and mysteries! My tbr is huge right now and I'm always looking to add to it if anyone has any recommendations! Question 10- What's one thing your really looking forward too? Visiting Canada for the first time -- which I will be doing in 2016. That wraps up the SECOND interview this month! thank you Gabriella Lepore for letting me interview you! her twitter and website will be below! Like I did last time! Go follow OfTomes on twitter for more information of Gabriella Lepore's books!